Pelton, R. H., Yang, D., and Gustafsson, E. (2019). "Polymers that strengthen never-dried joints between wet cellulose surfaces – A review," BioRes. 14(1), 2389-2419. Forming an adhesive joint between two wet cellulose surfaces before a drying step is important when manufacturing paper, foams, aerogels, other novel materials from wood pulp fibers, and various types of nanocellulose. This paper reviews the literature with an emphasis on the role of adhesive polymers on wet cellulose adhesion. Linkages between the organization of adhesives between the bonded surfaces and the strength of joints are emphasized. Relevant adhesion results from the surface forces apparatus, colloidal probe atomic force microscopy, paper wet-web strength, and wet-peeling of laminated regenerated cellulose membranes are considered. Objects formed from cellulose fibers, cellulose nanocrystals (CNC), and cellulose nanofibrils (CNF) all share the same limitation. They are weak when first formed, until most of the water has been removed. The relevant property is the never-dried strength or green strength of wet cellulose joints between contacting surfaces in water. A low never-dried strength causes a number of manufacturing challenges. For example, 3D-printed CNC inks must have a sufficient yield stress to maintain their shape after printing (Siqueira et al. 2017). Similarly, templated ultralow-density CNF foams must be dried by expensive processes, such as critical point drying, freeze-drying (Cervin et al. 2012), freeze-casting (Wicklein et al. 2015), and solvent exchange (Jin et al. 2004), to prevent damage from capillary forces during drying. Finally, when wet paper is formed by filtration of dilute fiber suspensions, the never-dried paper strength, called the wet-web strength, can limit the speed and efficiency of the papermaking process (Pikulik 1997; Belle and Odermatt 2016). The unifying feature of these examples is the difficulty in forming strong joints when cellulose surfaces are pushed together in water. The catastrophic loss of strength when many paper products are exposed to water is a common experience. In contrast, paper coffee filters and kitchen towels are sufficiently strong because the cellulose fiber network has been strengthened with heat curing polymers, called wet-strength resins (Wågberg and Björklund 1993; Epsy 1995). Although the chemistry varies, wet-strength resins all employ curing reactions that crosslink the resins and produce covalent grafts to wood pulp fiber surfaces, which strengthen the fiber-fiber joints. Most of the curing reactions require water removal and are promoted by the elevated temperatures associated with drying on paper machines. For nearly 100 years, these resins have produced paper products that are strong enough to survive exposure to water for short periods. In contrast, there are not any commercial polymeric products that have been applied to increase the strength of cellulose-cellulose joints as they are formed in water. Nevertheless, there are published reports that suggest such green strength polymers are possible. This paper reviews the literature on never-dried cellulose adhesion with an emphasis on the roles of adhesive polymers. Most of the old literature focused on paper wet-web strength, whereas the recent literature has included many AFM-CP studies of model cellulose surfaces. The goal is to propose design rules for adhesive polymers that enhance the never-dried adhesion between wet cellulose surfaces. Although this is believed to be the first review of polymers for never-dried adhesion between cellulose surfaces, excellent texts and reviews in relating areas are acknowledged, which includes, but is not limited to the interactions of polyelectrolyte-coated surfaces (Claesson et al. 2005), adhesion (Kendall 2001), soft adhesives (de Gennes 1996), wet adhesion between once-dried cellulose surfaces (Lindström et al. 2005), and wet-web paper strength (Retulainen and Salminen 2009). This section reviews the interactions that can contribute to the adhesion between cellulose surfaces in water. Van der Waals forces are always present and are attractive between like bodies in water. Colloidal probe atomic force microscopy (AFM-CP) has been used to measure the attractive van der Waals forces between cellulose surfaces in water (Notley et al. 2004). A combined Hamaker constant of 3.5 x 10-21 J has been reported, which is similar to silica or polystyrene interactions in water. In other words, van der Waals attractive forces are substantial. Nevertheless, wet adhesion forces between cellulose surfaces in water are weak. The usual explanations include electrostatic repulsion, surface roughness preventing close approach, and the presence of a hydrated surface layer causing steric repulsion. Whatever the reason, van der Waals forces are not sufficient to promote adhesion between wet cellulose surfaces. Covalent crosslinking between strength-enhancing polymer chains and covalent grafting to cellulose surfaces are important contributors to never-dried wet adhesion. Alcohol and carboxyl groups, the main functional groups on cellulose surfaces, are not very reactive in water at low temperature. Therefore to achieve grafting to cellulose, strength polymers must have reactive groups. However, very reactive groups such as isocyanides also react with water. Most of the published work demonstrating never-dried wet adhesion involves aldehyde chemistry. The aldehyde functional group can be present either on cellulose, a result of oxidation, or as part of the adhesive polymer. Cationic aldehyde starch (CAS) and cationic glyoxalated polyacrylamide (GCPAM) are examples of commercial, water-soluble aldehyde containing polymers. All polymer abbreviations are defined in the Appendix. 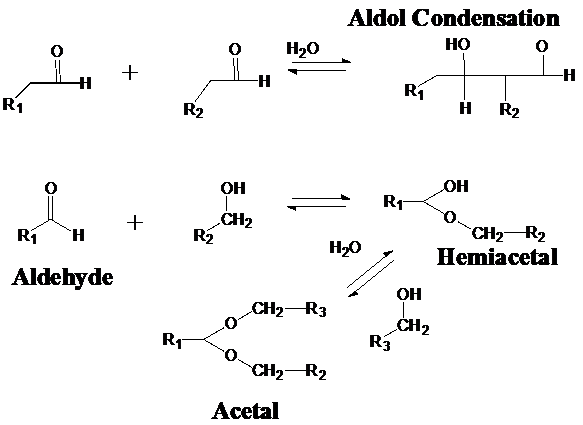 Scheme 1 shows the covalent linkages formed when aldehydes react with alcohols and with other aldehydes. Hemiacetal and acetal formation are catalyzed by acid or base. However these linkages are more stable in acidic conditions (Espy 1995). The labile nature of hemiacetal linkages in water results in “temporary” wet strength when aldehyde chemistry is employed in wet-strength resins. Also shown in Scheme 1 is the aldol condensation, a crosslinking reaction between two aldehydes. The aldol product has been proposed by Young (1978) to contribute to wet strengthening. The reaction products of polyvinylamine with aldehyde groups on an oxidized cellulose surface are shown in Scheme 2. Although imine linkages (also called Schiff bases) are also hydrolytically unstable, the authors’ adhesion results suggest that polyvinylamine (PVAm) forms stable bonds with aldehyde groups in water, and these are probably aminal linkages (Yang et al. 2018b). Scheme 2. Grafting reactions for PVAm on oxidize cellulose. Figure adapted from Yang et al. (2018b). The cellulose never-dried adhesion literature is dominated by results from four techniques: the surface forces apparatus (SFA), atomic force microscopy with colloidal probes (AFM-CP), wet-peeling, and tensile strength measurements of never-dried wet fiber webs. The first two provide measurements of both the work to push the surfaces into contact (lamination) and to pull off. In contrast, wet-peeling and wet tensile experiments yield macroscopic measurements of the work required to break bonds. Each technique will be briefly described. The SFA technique was developed by Israelachvili (1991) and measures both the forces as the surfaces move into contact (i.e., the lamination forces) and the adhesive forces as the surfaces are separated. The substrates forming the joint are atomically smooth mica sheets that are coated with thin regenerated cellulose films. The adhesive polyelectrolytes are applied by adsorption application. Achieving thin, atomically smooth cellulose substrates is challenging and hence only a few publications have involved wet cellulose (Kontturi et al. 2006). First reported by Ducker et al. (1992), AFM-CP has been applied by a number of researchers to measure cellulose-cellulose wet adhesion and friction. In this technique, a micron-sized cellulose sphere or a nanocellulose covered silica sphere, glued to an AFM cantilever, replaces the usual sharp tip. Atomic force microscopy measures the force to approach a planar cellulose film (the lamination step) and adhesion forces required to separate the surfaces after contact. Adsorption application is used to apply the adhesive. A cellulose sphere (i.e., colloidal probe) and planar cellulose substrate can be treated separately with polyelectrolyte. It is challenging to relate AFM-CP pull-off forces, which are usually in the of order mN/m, to macroscopic wet-peel or paper wet-web strength. A direct comparison is given below, showing that the work of joint rupture, as determined by AFM-CP, is 1000 times less than the wet-peel work. Following the lead of McLaren (1948), an adhesion measurement was developed whereby two wet regenerated cellulose membranes are treated with adhesive and pressed together (i.e., laminated) with a contact area of 5 cm × 2 cm. The wet-peel strength is determined as the force required to separate the laminated membranes by 90° peeling on a mechanical testing machine. Wet-peeling results were first published by Kurosu and Pelton (2004) and a review of the technique highlighting the important experimental aspects was recently published by Yang et al. (2018a). Using wet-peeling, it is possible to employ tests of all of the joint compositions. Furthermore, wet-peel experiments without a drying step result in never-dried wet adhesion measurements that are reproducible and sensitive to adhesive chemistry. The papermaking technology literature usually presents wet-web tensile strengths plotted as a function of the paper solids content, and the resulting curves can be fitted to power laws (Shallhorn 2002). There is a substantial amount of literature that describes the influence of pulp types (Seth 1995), fillers, and other papermaking variables on the wet-web strength. These factors are not reviewed here because they were recently summarized in a review by Belle and Odermatt (2016). There are no adhesive interactions between wood pulp fibers in water in the absence of added polymers because all fiber-fiber interactions (electrostatic and/or steric) are repulsive. In dilute aqueous suspension, flexible wood pulp fibers form flocs because of mechanical entanglement (Celzard et al. 2009). The classic explanation of wet-web strength invokes capillary forces pulling fibers into contact. Page (1993) modified his paper tensile strength model to account for capillary forces and was able to explain the influence of fiber length and coarseness on wet-web strength (Page 1993). Tejado and van de Ven (2010) critically evaluated the classic theories of paper wet-web strength and proposed that wet-web strength is a combination of entanglement friction plus a fiber-fiber adhesion component at higher solids contents. Entanglement involves the work required to pull apart mechanically entwined, long thin fiber. Thus it depends upon fiber length, flexibility, and friction coefficient, whereas the entanglement contribution is not particularly sensitive to the solids content. Figure 1 shows a more generic version of a figure by Tejado and van de Ven (2010). Capillary forces will disappear when the free water is gone, whereas entanglement forces may increase with solids content. The detailed nature of the non-adhesive contributions (entanglement vs. capillary forces vs. something else) remain an open issue. The focus of this review is the potential to increase the adhesive contribution with polymers, shifting the fiber-fiber adhesion curve towards the upper left of Fig. 1. The interpretation of wet-web mechanical properties in the presence of polymeric adhesives is complicated by the fact that polyelectrolytes can enhance drainage, which results in a higher solids content and changes the sheet structure by fines deposition and fiber flocculation. Therefore, polymers that improve the wet-web strength do not necessarily influence fiber-fiber adhesion or friction. Trout (1951) emphasized the need to compare wet-web properties as a function of the solids content. This review examines the literature that describes never-dried cellulose-cellulose joints. The never-dried cellulose adhesion literature is divided into two sections: results involving a single adhesive and those employing two or more adhesives, usually applied in multiple steps. An idealized adhesive joint consists of a layer of adhesive sandwiched between two substrate surfaces, forming a joint. In general, joint fabrication consists of three steps: 1) applying adhesive to one or both substrate surfaces, 2) lamination by forcing the surfaces into contact, and 3) curing and/or drying the joint. In the case of never-dried wet cellulose joints, only the adhesive application and lamination steps are relevant because the joints are not dried. The following sections will show that never-dried adhesion is extremely sensitive to the quantity and distribution of adhesive in the cellulose-cellulose joints. There is a range of possible joint structures, along with a nomenclature scheme. In papermaking, the adhesive application is achieved by adsorption onto fibers in the wet-end of the paper machine, and fiber surfaces are usually coated with a saturated monolayer. When two coated fiber surfaces come together, they form an αα joint (Fig. 2). The αα joint is the most important type because it is the easiest to manufacture. The polymer content in αα joints is denoted as Γsat, and is in the range of 1-10 mg/m2 for PVAm on regenerated cellulose (Yang et al. 2018b). There are few published values for saturation coverage of adsorbed on wood pulp fibers expressed as mg/m2 because the required fiber specific surface areas (m2/g) are often unknown. Fig. 2. Schematic illustration of the types of polymer-reinforced wet cellulose-cellulose joints assembled with one type of polymer; Γ is the quantity of adhesive polymer in the joint expressed as mg of dry polymer per m2 of joint. Joint type α is prepared by coating one cellulose surface to give a saturated monolayer of polymer, followed by lamination with an untreated cellulose surface. Although α joints can be strong, they are not easily manufactured. This will be examined further in the final discussion. Finally, type d-Γ joints, where Γ is the coverage of dry adhesive in the joint expressed as mg/m2, can be prepared by casting cellulose fiber or particles and suspending them in an adhesive polymer solution. Because the specific gravity of most dried polymers is close to 1, Γ is also equal to the average thickness in nm of the dried adhesive film in the joints. Type d-Γ joints can range from sub-monolayer adhesive coverages to a dry adhesive layer with a thickness of hundreds of nanometers. In a later section describing two or more adhesive applications, this joint structure classification will be discussed further. Table 1 lists publications that report never-dried wet adhesion in the presence of an individual type of polyelectrolyte adhesive. The first column in Table 1 gives the type of strength enhancing polymer. The second column titled “G” indicates whether or not the adhesive polymer has the potential to form covalent grafts to the cellulose substrate surface in the presence of free water. 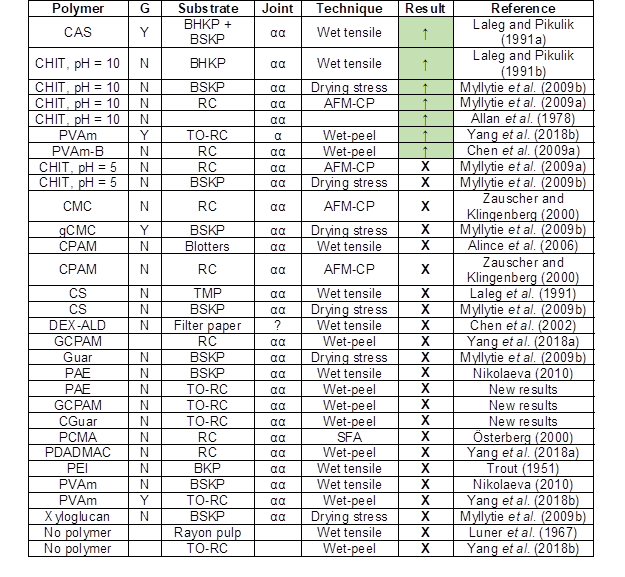 The third column shows the cellulose substrate type. The next column describes the adhesive joint type (Fig. 2). It is impossible to quantitatively compare results from such a wide range of experiments. Instead, it was simply stated if the polymer can or cannot increase never-dried wet adhesion. Only the first few entries in Table 1 correspond to polymers that cause never-dried wet adhesion. The ineffective polymers will be discussed first with a view of understanding the key mechanisms. Most of the polymers listed in Table 1 are ineffective at enhancing the never-dried adhesion between wet cellulose surfaces, which raises the question: why are single polymers so ineffective? Österberg (2000) reported SFA measurements and showed that the approach of cellulose surfaces in water was repulsive when the surfaces were coated with an adsorbed layer of a linear quaternary ammonium polyelectrolyte, i.e., an αα joint. Only sub-monolayer polyelectrolyte coatings yielded adhesive interactions. Poptoshev et al. (2000) reported measurements between glass and cellulose surfaces in the presence of polyvinylamine (PVAm), a highly cationic linear polymer. They also reported that αα joints were repulsive in water with little adhesion upon retraction. Zauscher and Klingenberg (2000) used AFM-CP to measure the approach and adhesion forces for cellulose surfaces coated with monolayers of adsorbed cationic polyacrylamide (CPAM) or carboxymethyl cellulose (CMC). The approach of cellulose surfaces saturated with either polyelectrolyte was repulsive in water. Only sub-monolayer coverages of CPAM gave some bridging adhesion. Adsorbed layers of CPAM or CMC also reduced the friction between wet cellulose surfaces (Zauscher and Klingenberg 2001). Reduced friction should decrease the entanglement contribution to the wet-web strength (Fig. 1). Laine et al. (2000) described a process by which aqueous CMC in the presence of calcium ions at elevated temperatures was irreversibly deposited onto cellulose surfaces. The adsorbed amount of high-molecular weight CMC was 10 mg/m2 to 20 mg/m2, which corresponded to an 8-nm- to 15-nm-thick CMC film, assuming a specific surface area of bleached kraft pulp fibers of 1.37 m2/g (Lindström and O’Brien 1986). Liu et al. (2011) studied deposition onto model regenerated cellulose films at lower temperatures and reported that the dry CMC coverage was approximately 0.3 mg/m2 and that the adsorbed layer was swollen with a water content of 90% to 95%. In spite of subsequent publications (Kargl et al. 2012), the attachment mechanism is unknown. The literature suggests that CMC is firmly attached, so it was grouped with other cellulose grafted polymers and called grafted carboxymethyl cellulose (gCMC) (Laine et al. 2002). Although gCMC can provide spectacular improvements in the paper dry strength and once-dried wet strength when combined with polyamide-amine epichlorohydrin (PAE) (Laine et al. 2002), αα joints based on gCMC have no never-dried wet strength (Myllytie et al. 2009b). An alternative to treating fibers with polymers is to modify the fiber surface properties to promote adhesion. The following discussion summarizes some of the major studies that link cellulose oxidation to the joint strength. While many studies showed an improved dry strength and once-dried wet strength, none improved the never-dried wet strength. The priming of cellulose surfaces by oxidation has a long history. The work of Luner et al. (1967) with regenerated cellulose is typical in that it showed that aldehyde groups increase the wet strength (after drying), whereas there was no evidence of an improved never-dried wet-web strength. They proposed that the enhanced once-dried wet strength with oxidized fiber-fiber joints was because of enhanced hydrogen bonding between the aldehydes and cellulose. This was an unusual suggestion because hemiacetal and acetal formation between aldehydes and alcohols is usually suggested as the mechanism for aldehyde wet strength resins. Aldol condensation reactions have also been proposed (Young 1978). Inspired by Kitaoka et al. (1999) and the increase in nanocellulose publications, there have been reports describing TEMPO-mediated oxidation of cellulose, which generates a mixture of carboxyl and aldehyde groups on exposed surfaces (Saito and Isogai 2006). Saito and Isogai (2007) compared the once-dried wet strength of papers prepared from TEMPO-oxidized fibers with four different polymers, and came up with the following ranking: PVAm > PAE CPAM > PEI. Also, Saito and Isogai (2007) proposed specific covalent bond formation mechanisms between the various polymers and oxidized cellulose. However, none of these combinations have any wet-web strength benefits. The never-dried wet-peel strength of TEMPO-oxidized regenerated cellulose is 2 N/m at a 55% laminate solids content (Yang et al. 2018b), which is the lowest value that can be measured. When the laminates were allowed to dry at room temperature and were then rewetted, the wet-peel force was approximately 10 N/m (Yang et al. 2018a), which is weak. Finally, the interest in nanocellulose materials has rejuvenated interest in oxidation. The recent work by Erlandsson et al. (2018) is a good example of this. They showed hemiacetal bonds formed when periodate oxidized CNF particles and were pushed together by freezing ice. In another example, Syverud et al. (2015) showed the TEMPO-oxidized CNF suspensions formed hydrogels in the presence of low molecular diamines forming shift base crosslinks. These two examples show routes to wet-adhesion without adhesive polymers. In summary, both the nanoscale and macroscale measurements provide overwhelming evidence to support the conclusion that for αα joints formed between cellulose surfaces bearing adsorbed polyelectrolyte, work must be applied to force the surfaces together to overcome electrosteric repulsion and the cohesive interactions after contact are low because of limited interpenetration of adsorbed polymers. This is not a new conclusion, and a similar conclusion has been reached in the literature before (Alince et al. 2006). Nevertheless, some of the polymers in Table 1 were shown to be effective, and these will now be considered. In a series of studies, paper machine trials were reported, in which 1% cationic aldehyde starch (CAS) improved the wet-web breaking length of a fine paper furnish by 18% with a 50% solids content (Solarek et al. 1987; Laleg and Pikulik 1991a, 1993a,b). Figure 3 was adapted from the original publication of Laleg and Pikulik (1993a) and compares the never-dried wet tensile strength and solids contents for laboratory handsheets. All of the webs with solids contents below 45% were weak, whereas all of the webs with solids contents above 50% had a strength that increased with the solids content. Comparing the curves showed that the CAS resulted in stronger wet-webs. Laleg et al. (1991) proposed that the wet-web strength was improved by the formation of covalent acetal and hemiacetal linkages between the starch and fibers. This is a controversial explanation because these linkages are difficult to form in water. For example, it is shown below (Table 3) that there is no never-dried wet adhesion between oxidized cellulose membranes bearing aldehyde groups. On the other hand, once-dried joints formed with oxidized membranes give some wet adhesion (~10 N/m wet-peel), suggesting hemiacetal formation during drying Yang (2018). Although the mechanisms may be debatable, Laleg’s results have been validated by others. Retulainen and Salminen (2009) recently demonstrated that an experimental dialdehyde starch increased the wet-web strength, as measured by the extent of web stretching on a high-speed (1 m/s) laboratory web tension device. The wet tensile strength properties of filter papers impregnated with dextran-aldehyde prepared by Chen et al. (2002) were similar to those of starch aldehyde produced by Laleg et al. (1991). No evidence of wet strength enhancement was observed, unless the filter papers were dried first. It was concluded that it is difficult, but not impossible, to form acetal and hemiacetal crosslinks with fiber surfaces, unless the water was removed. Allan et al. (1978) were among the earliest to suggest the use of chitosan strengthening of wet webs and wet paper. They established that chitosan was most effective when applied at a pH of 10 and conditions under which chitosan was not water soluble. They recognized that instead of an adsorbed monolayer from solution, phase-separated chitosan particles were depositing on the fiber surfaces. This was recognized as an advantage because it put more chitosan on the fiber surfaces without inducing fiber flocculation before sheet making. Laleg and Pikulik (1991b) confirmed the earlier experimental results and proposed molecular-scale interactions leading to wet-web strength. In a nice example of the application of modern techniques, Myllytie et al. (2009a) used quartz crystal microbalance measurements to show that adsorbed chitosan layers shrank and became more elastic at a high pH. Using AFM-CP, they confirmed that chitosan-coated surfaces were repulsive. However, by forcing the surfaces together, a remarkable never-dried pull-off force was observed. The pull-off force of the joints increased with the compression load during their formation, and also with increasing pH. They suggested that a possible mechanism involved the presence of tacky adsorbed colloidal chitosan particles. The tacky nanoparticle mechanism is intriguing and might explain why some colloidal-sized polyelectrolyte complexes (PECs) can increase the wet-web strength (see the PEC Joints section below). Kurosu and Pelton (2004) and DiFlavio et al. (2005) reported wet-peeling results using PVAm as an adhesive and TEMPO-oxidized cellulose as the substrate. As long as the joints were dried once, notable wet strength values were observed, even with room temperature drying at a 50% relative humidity. At the time, it was proposed that drying was necessary to promote PVAm chemical grafting to cellulose. However, results from a recent investigation suggested that PVAm forms imine and aminal linkages with aldehydes (see Scheme 2) present on oxidized cellulose in water, and thus drying is not necessary for grafting to occur (Yang et al. 2018b). Figure 4 compares the never-dried adhesion for three joint structures of PVAm on TEMPO-oxidized cellulose. The differences are dramatic, as the results showed that α joints were strong in spite of having only 1.9 mg/m2 dry PVAm in the joints, αα joints with twice as much polymer were weak, and d-30 joints with a high polymer content (30 mg/m2) had an intermediate adhesion (Yang et al. 2018b). With α joints, the PVAm layer can simultaneously graft to both cellulose surfaces in water. The enhanced strength of α joints compared with αα joints has also been observed in SFA and AFM-CP experiments (Claesson et al. 2003). In contrast, αα joints were weak because electrosteric repulsion prevented attractive interactions between the adsorbed polymer layers. Finally, the thick d-30 joints resulted in some adhesion at higher solids contents. The role of aldehyde groups in never-dried adhesion with PVAm is illustrated in Fig. 5. The reduction process converted aldehydes to alcohols, whereas the carboxyl groups remained unchanged. The removal of aldehydes resulted in lower wet-peel values. This supported the conclusion that primary amines condense with aldehydes giving aminal and imine linkages in water – see Scheme 2. A decade ago the polymer polyvinylamine-g-phenylboronic acid (PVAm-B) was developed, which gives rise to never-dried wet adhesion between unmodified regenerated cellulose surfaces (Chen et al. 2009b). The structure of PVAm-B is presented in Fig. 6A. It was proposed that the never-dried wet adhesion resulted from covalent linkages between the borate and reducing end of the cellulose chains, as well as PVAm-B/PVAm-B cohesion because of electrostatic and possibly dative bond formation. Figure 6A shows the 90° wet-peel delamination force for untreated membranes laminated with adsorbed PVAm-B, as a function of the lamination pH. To put these results in context, anything below 10 N/m is very weak, whereas 60 N/m is very high. The delamination force units of N/m are dimensionally equivalent to units of energy/area, which is the peeling work required to separate αα laminates. For example, the peeling work (pH = 10.5) of 55 N/m is equivalent to 55 J/m2. This high delamination force requires both high cellulose/PVAm-B adhesion and high PVAm-B/PVAm-B cohesion. Figure 6A also shows that the maximum AFM-CP pull-off force is a function of the solution pH. The wet-peel delamination forces and AFM-CP maximum pull-off forces showed similar pH dependencies. Figure 6B shows a sample retraction force curve from an AFM-CP experiment. The approach curve (not shown) was repulsive, which reflected the electrosteric repulsion of PVAm-B-coated surfaces in water. After reaching a compression force of 15 nN, the probe was retracted. The pull-off required the application of a maximum force of approximately -15 nN. For comparison with wet-peeling, the retraction force curve is roughly integrated in Fig. 6B to show that approximately 7.5 x 10-16 J were consumed when pulling the probe from the surface. It was further assumed that the contact area on the film between the sphere and cellulose film was 0.75 μm2, which corresponded to a sphere radius of 12 μm, embedded in a 10-nm-thick layer of PVAm-B. The corresponding pull-off work per bonded area was 0.001 N/m, which was four orders of magnitude smaller than the work from wet-peeling. This reflected the fundamental differences in the two test types. With AFM-CP, the lamination pressure is approximately 15 kPa, whereas it is 323 kPa for the wet-peel test. The joint age before testing (i.e., dwell time) and crack growth rates were different for the two types of experiments as well.